Less than ten years after the death of the Prophet Muhammad Antioch was taken by the Muslims and its name was change into Antakiya. After more than three hundred years on Muslim hands Antioch fell to the Ortodox Byzantines in 969. They kept the city until 1084. In this year Antioch was taken by the Muslim Seljuq Turks and towards the end of the 11th century the city was ruled by Yağısıyan who held it as a fief. In the meantime something happened in France. In 1095 a council was held in Clermont. It was the Pope Urban II who presided. Before the council started the Pope had received Byzantine ambassadors who asked for western support in their fight against the Seljuq Turks. In 1071 the Seljuqs had crushed a Byzantine army at Manzikert in eastern Anatolia and within the next 20 years they had conquered most of the Middle East, Jerusalem and Antioch included. This meant a considerable loss to the Byzantine Empire, but also the Catholic West felt the change as the pilgrims to Jerusalem now had to pass through Seljuq territory. “Since, O sons of God, you have promised the Lord to maintain peace more earnestly than heretofore in your midst, and faithfully to sustain the rights of Holy Church, there still remains for you, who are newly aroused by this divine correction, a very necessary work, in which you can show the strength of your good will by a certain further duty, God’s concern and your own. For you must hasten to carry aid to your brethren dwelling in the East, who need your help, which they often have asked. For the Turks, a Persian people, have attacked them, as many of you already know, and have advanced as far into the Roman territory as that part of the Mediterranean which is called the Arm of St. George; and, by seizing more and more of the lands of the Christians, they have already often conquered them in battle, have killed and captured many, have destroyed the churches, and have devastated the Kingdom of God. If you allow them to continue much longer, they will subjugate God’s faithful yet more widely. It seems that this affair from the outset was to be a rather unchristian business. It seems that the Pope had forgotten the words of Jesus to the Apostle Peter: “Put up again thy sword into his place: for all they that take the sword shall perish with the sword.”  In fact, it seems that the early Christians had a completely different approach to those persecuting them that that of the Pope. For instance, Jesus was quoted saying: “Ye have heard that it hath been said, Thou shalt love thy neighbour, and hate thine enemy. But I say unto you, Love your enemies, bless them that curse you, do good to them that hate you, and pray for them which despitefully use you, and persecute you.”  The Pope evidently ignored this. As to his co-religionists: only few of them knew Latin and it was only in this language the Bible was distributed in the eleventh century. As the spiritual leader of the First Crusade Urban chose Adhemar de Monteil, Bishop of Le Puy-en Verlay, who at least should be able to read the words of Jesus in Latin. As we shall see this did not damp his bellicosity. This was the horde that on October 21, 1097 stood at the walls of Antioch. The Iron Bridge. 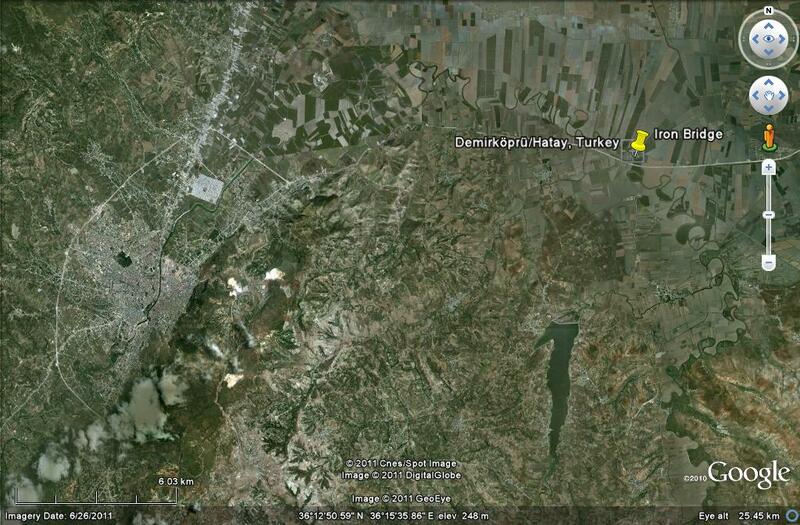 The city of Antioch (Antakya) is seen in the left side of the picture, west of Mount Silpius. 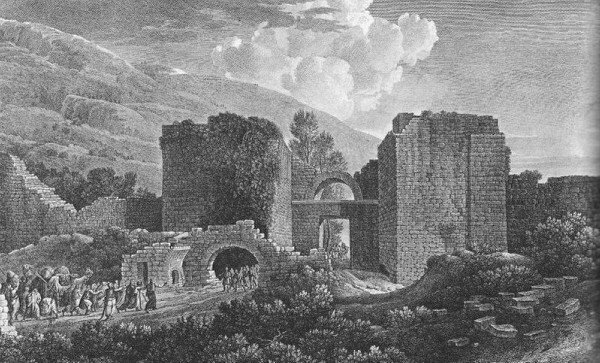 The ruins of the Beroea Gate (or Aleppo Gate). This was where the Crusaders arrived after the battle at the Iron Bridge. In the background to the left we see Mount Staurin and Mount Silpius behind it. August C. Krey, ed. The First Crusade (Princeton: Princeton University Press, 1921), 30, 31. The Gospel of Matthew, chapter 26, verse 52 (King James Version). The Gospel of Matthew, chapter 5, verses 43, 44. Krey, The First Crusade, 48. Steven Runciman, A History of the Crusades 1 (Harmondsworth: Penguin Books, 1971), 216.